Take a Journey with Jesus! 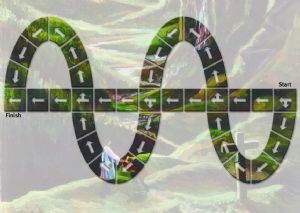 The game represents two pathways, one a straight path, and one a winding path, at the start of the game all players will be asked a question. Those getting the question right will be on the straight path whilst those getting their question wrong will be on the winding path. There are 3 sets of questions of graded difficulty, all taken from the Bible.